Amongst the many beautiful destinations to visit in the world, Maldives retains its unrivalled luxurious aura that keeps on attracting those seeking solace and tranquility, and of course a lot of romance as well. Ever since Maldives was discovered, it has been an obvious choice to visit to have the best beach holiday ever! Maldives is a place that would make you feel quiescent, where you can simply gaze at its white-sand beaches, crystalline lagoons and azure water. Having known the fact that, Maldives, despite being a popular honeymoon destination, today, it receives many thumps on its ground even by family vacationers who come to rejuvenate amid the scenic island of Maldives. Nonetheless, this holiday destination can also be perfect for food fanatics, history and art lovers as well as adventurers. Through this blog here, you can find 20 places to visit when in the Maldives that are suitable for every genre of tourists visiting. Romance in the many islands in the Maldives offering romantic hideout villas, a perfect paradise for lovey-dovies. In Maldives, there are about 75 private islands offering luxurious retreats and the below mentions are some of the exquisite ones. Amongst the many islands, COMO Cocoa is one of the most sought after places in the island country of Maldives. It houses a large number of resorts and the best part of it all is the presence of the water villas (you have to experience staying in one of these). 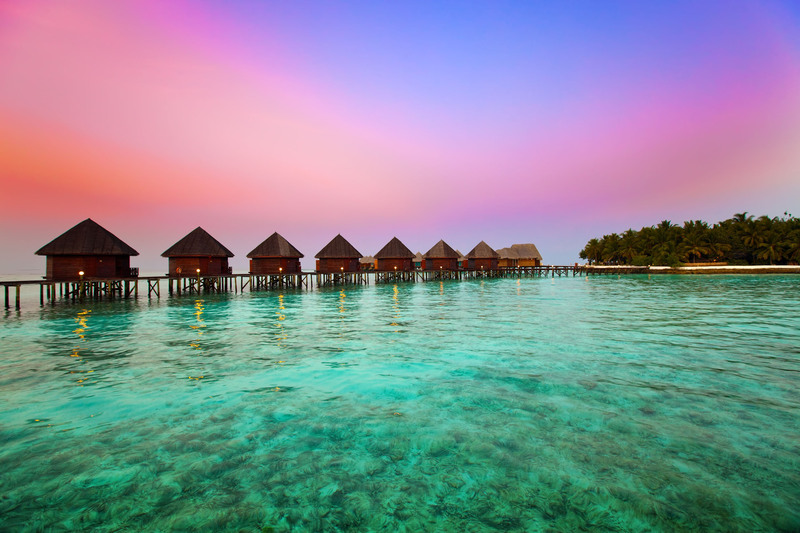 The COMO Cocoa Island has around 33 water villas, each offering only the best facilities. Once your staycation is sorted, you can take a long stroll on the white powder sand and indulge in spa retreat. The restaurant and the food is always top-notch and so is the rejuvenating activities like diving and snorkelling that can be enjoyed at the house reef. If you are looking for a place away from the crowd, this is an ideal place to be. Baros is a high rated and popular island in Maldives. With sun-kissed beaches and boutique luxury resort, this island is famous for its natural elegance and beautiful corals. Baros has a number of water villas as well as island resorts providing luxe amenities, along with a few restaurants and bars in the vicinity. In Baros, you can dip your feet in the cyan-blue water and relax your muscles in the spa. For the adventure spirited couples, there are also a number of watersports. One of the best attractions about this island is perhaps the arrangement of the water villas in shape of a flower bud. A little rubbernecking can help see this beautiful sight from a seaplane as you land. 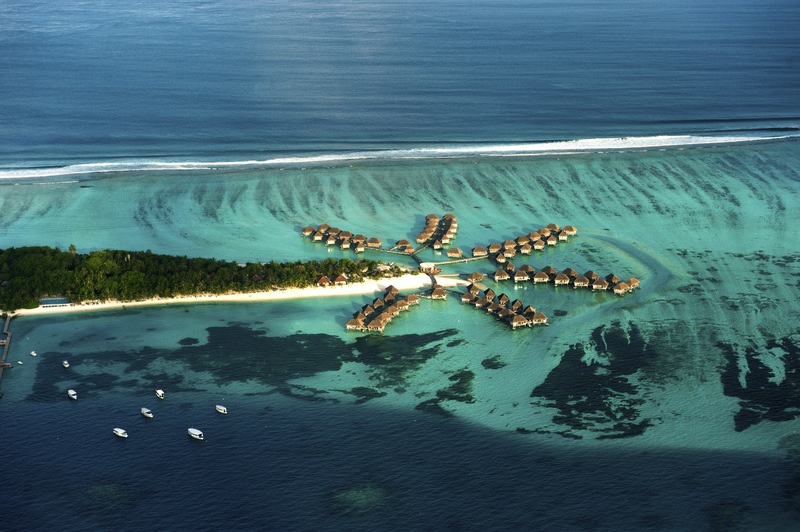 Emboodhu Finolhu Island featuring around 55 water villas, also houses the luxurious Taj Exotica Resort. Here, you will get pampered with 5-star accommodation and amenities, and you can also delve into a revitalizing spa retreat. However, since it being close to the Maldives International Airport, this island is conveniently accessed via speedboat (for those who prefer). The resort in Mihiri island are perhaps build for those who love a complete detoxing environment as no television sets are provided. I mean, why would you even need one? Mihiri Island Resort offers excellent rooms that are made ideal for honeymooners along with Adam and Eve spa treatments. The resort has around 30 water villas and a few island resorts. The island restaurants offer exquisite food over romantic dinner. However, to partake in some fun activities, the island also has diving and snorkelling water sport options made available. What can go wrong in the capital itself, it’s brilliantly lit buildings, restaurants, bars, and tourist attractions will occupy you all day. Of course, such itinerary is suitable for those couples who enjoy exploring places. Why, Male is because, the international airport is located here, right from the time you reach, you can explore its surroundings. While here, you can take a dip in the protected ocean pool, Artificial Beach and indulge in underwater scooter riding and snorkeling. You can as well go sightseeing places like the Tsunami Monument, Grand Friday Mosque, Male Fish Market, Sultan Mosque and Male National Museum. Vacationing with family can be very tricky, often; elders prefer the beach and spa while youngsters prefer the water sports. Thus, basing on that, here are a few best family-friendly islands offering well-maintained resorts dedicated for a perfect family holiday. This popular place is where you can rejuvenate amid the lustrous sight of the calm water (even when you are with kids) because, Huvahendhoo has Lily Beach Resort and Spa that serves best facilities for those who come in packs. This is family-oriented resort island that houses luxe rooms and also restaurants that serve special delicacies for little ones. Now, while the parents go for a spa, the children can spend time in the ‘Kids’ Club.’ There are two swimming pool, tennis courts, billiards and beach volleyball. You will never run out of activities here in Huvahendhoo Island, Lily Beach Resort and Spa. Owned by the Hilton Hotels group, the Conrad Maldives in Rangali Island is one of the best places to stay when on a vacation with family. In Rangali Island, you can joult in various family oriented activities like snorkeling and diving as well as island hopping, fishing, dolphin sighting and more (it depends on the weather). The resort in the island also has a Kids’ Club, where infinity swimming pool, spa and indoor sports are provided. Surrounded by water on all sides, you may feel isolated (only with a want to never go back). Here in Halaveli, you can rejuvenate and spend quality time with family doing nothing but just ‘FUN’. And to have the best value for money when you are on your family vacation, the island also houses the Constance Halaveli Resort, the resort has around 57 water villas and the best part is, since kids enjoy spending some time with their favourite channels, the rooms are intact with satellite television and even an iMac entertainment system. The Constance Resort in Halaveli Island, similar to other islands has a Kids Club offering activities like paddle boats and swimming pools. The island houses Jahaz Restaurant and Bar serving only the best cuisine and drinks making your evening memorable. No matter where you look, only a sense of peace will surround you in the island of Dhigu. With its white sand and baby blue sky, you can get your feet in the water with a feeling of ‘tranquillity’. Here, the island also houses Anantara Dhigu Resort & Spa that has 36 water villas offering infinity edge bathtub with a view of the calm-blue lagoon. ‘A sight that will leave you awe-inspired.’ This resort comes under 5-star category having enormous rooms with the best facilities. There are four restaurants at Anantara Dhigu Resort which offer delicious food and it is a mere ferry ride towards the adjoining island. This resort also has a Dhoni Kids’ Club that will keep the younger ones entertained all day in activities. It is always fun to hangout with your family and kids, exploring places and collecting sweet memories. And in the capital, Male, there are a bunch of places to visit that is best experienced with children. Perhaps, this is one of the best things to do or experience with your kids while in Male, the capital island. Just so you don’t get confused by its name, Whale Submarine is not for viewing whales but observing life on a reef and it is a popular highlight in the island. This submarine will take you on an underwater tour, where you get to see colorful corals and beautiful marine species. A few species you get to see are reef fish, blue or yellow striped snappers, yellow box fish, lionfish and turtles as well. This 45 minute tour will provide knowledge to the kids and even elders who love marine species. Street shopping is definitely a fun thing to do and a perfect spot where you can find almost everything is in Majeedhee Magu. A walk down the main road of Male you can see numerous shops selling varieties of goods. From latest fashion wear to gadgets to smallest commodities and even locally crafted items. You can visit this place with your family and spend a day sightseeing local attractions and can also savour delicious food in Juways Cafe and Restaurant, Seagull Cafe or Dinemore Central. In Majeedhee Magu, the shops have a beautiful collection of garments, jewellery, watches, handbags, electronics, perfumes and cosmetics. The shops remain open from 9 am to 11 in the night. Although being a popular island in Maldives, always receiving tourists from across the globe, Male does not own a natural beach. Thus, a man-made beach was constructed and called Artificial Beach. If island hopping or staying in luxurious resorts is not your thing, you and your family can visit this place filled with fun activities. Here, a number of entertainments can also be witnessed along with many exciting water sports and if hunger strikes, you can visit the Dinemore or Oxygen Cafe located in the vicinity of the Artificial Beach. Planning to visit a new country means a detailed research about all the attractions and hotels and transport, so why not learn about its history, art and culture for a change as well. The island of Maldives, witnessed a lot of mishaps in its past and to let visitors know a thing or two, one of its islands, Male has a few treasures installed. ‘Check it out’. The National Museum is located in Male and it preserves a large collection of historic artefacts that traces the history of Maldivian Islands. This three-storied museum is a part of the 17th century Maldivian Royal Palace compound, which also has a Sultan Park (Public Park). Inside the museum, you will find a collection of well preserved galleries and artifacts of weaponry, household wares, religious paraphernalia, Arabic and Thaana-engraved pieces of wood and more. The major highlights of the museum are the 11th-century piece from Alifu Thoddoo, a coral stone head of Lord Buddha; a 13th century engraved wooden plank from Hukuru Miskiiy and Feyli Kolhu of Sultan Ghaazee Mohamed. In Male, the National Museum is a popular attraction visited by many art connoisseurs, it is opened everyday, 10am-4pm (except friday). It’s impressive modern structure will definately spell-bind you, its simplicity and white marbled mosque is the biggest in the country. Grand Friday Mosque has a striking plainness look on the exterior with a golden dome above (the gold is anodised aluminium). A visit to this place must be done between 9am and 5pm (avoid prayer times). Since it is a religious site, a proper dress code is mandatory with full length cloths for both men and women. Inside, you can see main prayer hall that can accommodate upto 5000 worshippers; it also has an Islamic Centre that includes a classroom, conference hall and a library. Erected to memorialize those who lost their lives in a devastating nature’s fury that took place in 2004 – Tsunami Monument is a beautiful structure located on the coast line of Male, on the Boduthakurufaanu Magu. This iconic monuments architectural design is adorned with spheres encircled with ring like structure. You can get a beautiful sunset view from here. However, the beach near the monument is also famous among tourists especially for surfers as it is said to be the best spot for surfing. ‘Wildlife and Adventure’ go well together in Maldives as you can partake in some water sports and witness oceanic species as well. There are many atolls around where you can find hundreds of species and the sources that lead you to them are adventure sports and recreational activities. You can get a wide range of wildlife in Maldives to which these islands are not new to the marine life that take refuge in the colourful coral reefs and its many atolls. You can find beautiful oceanic species like dolphins, blue-stripe snapper, oriental sweet lips, moorish idols, angelfish, unicorn fish, as well as some bigger fishes like sharks, manta rays and stingrays. However, these islands are also home to different species of birds. Herons, seagulls, cranes, are common bird in Maldives, speaking of which, fruit-bats are also widely seen flocking around. Yes, it is true that the many island resorts of Maldives offer exhilarating activities but what are the mere chances for those who come to spend time in the capital? Well, to be fair, the island of Male has a club for adventure or recreational activities that can be enjoyed by all sorts of vacationers. Try the Dive Club in Male Island in your holiday in Maldives. It offers activities like underwater scooter trip, scuba diving, fishing and island hopping. Feeling insecure to try out something new? Well, not to worry as there are professional guides available as well. Often when on a vacation, we tend to list ‘what to eat’ at the last page of the to do list but, it is believed that, food is the first thing that unites us with a new destination. Thus, while in Maldives, despite savouring in some international restaurants, you have to go local and try some Maldivian cuisine as well. Its impressive decor, charming garden and trees around the terrace makes Seagull Cafe House one of the best places to eat and spend a relaxing time in Male. Its menu consists of a wide range of delicacies from sandwiches to curries, burgers to wraps, grills to pasta and of course fish. You have to visit this beautiful café while here that is located in the midst of the city centre. Seagull Cafe House remains open from 8 am to 11 pm. If you love thai cuisine, you have to visit to Thai Wok to savour its authentic food. Located in Hithaffivinivaa Magu, it has a charming ambience and delicious food. The aroma of their food may tempt you to come back for more. While on a family trip, the best part is the weekly buffet and you have to visit for that. Maldives absolute fame and luxurious aura captivates every vacationer. Its clear blue waters, white sandy beaches, soothing villas and scrumptious food are the things that vacationers are drawn towards. The second thing that invites people are the adventure, water sports, wild species and underwater life. These islands of Maldives certainly are a treasure trove that must be explored before the island disappears. Well, not to sound very cliched, if the images did not really help you to virtually be there, Tour My India can certainly help you get there. You can call us at +91-9212553106 or send us your queries at info@tourmyindia.com to know more about the deals and tour packages we provide. Also, if you liked this blog, please like and share. Happy vacationing!